A rosary is a fitting wedding gift for Catholic weddings. 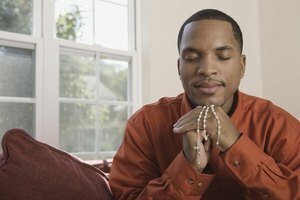 Prayer beads are used in many religions as a way to center the mind and concentrate on the prayer and meditation in the heart. 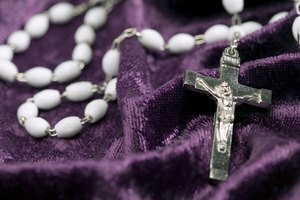 The rosary beads are used in prayer by those that practice the Catholic faith. Two rosaries made into one is called a wedding rosary and is given to the bride and groom to begin their Catholic faith-filled lives together. You can make a wedding rosary. Cut the cord into three sections, two three-foot sections and one five-inch section. Measure a five-inch section of length from the end of one cord and tie a knot. Thread the cord through the bottom and through the right loop of the first centerpiece pendant. Thread one silver bead next. 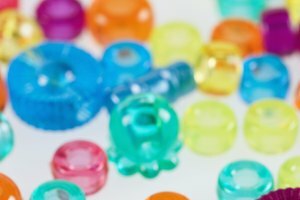 Thread ten clear crystal beads that measure 10 mm. 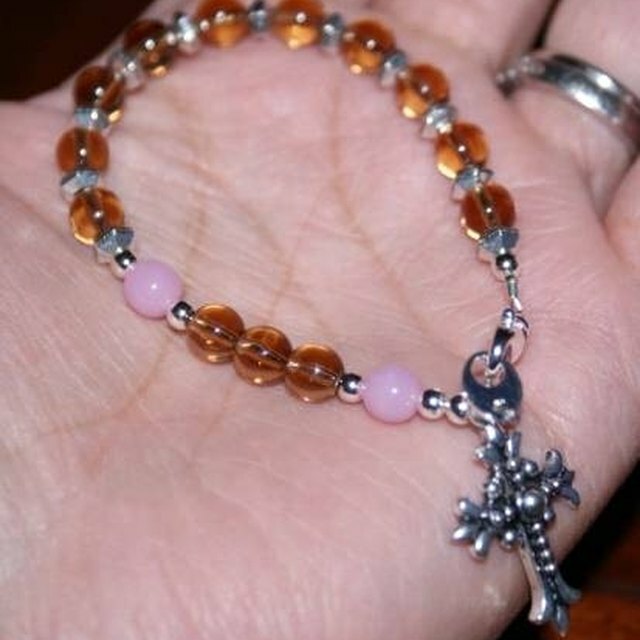 The clear crystal beads are called Hail Mary beads and represent a decade of the rosary. Add another silver bead. 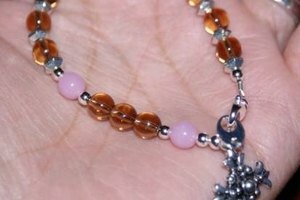 The silver beads act to separate the sections of the rosary. Add a silver bead then thread a 10 mm crystal bead and one more silver bead. This 10 mm crystal bead represents the Our Father bead and is separated by the silver beads from the decade beads. 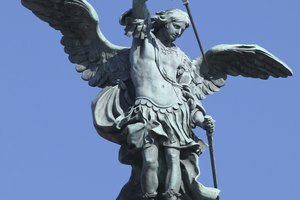 Make four more decades of the rosary and three Our Father beads in the same fashion. Add a silver bead after the last decade. String the cord through the top left side of the first centerpiece pendant and tie a knot in the cord. Cut off any remaining cord. Add two silver beads, one 10 mm clear crystal bead, three silver beads, three 10 mm clear crystal beads, three silver beads, one 10 mm clear crystal bead and two silver beads. The first and last crystal beads are called Paters, or Our Father beads and the three crystal beads between the Paters are called Aves, or Hail Mary beads. String the end of the cord through the top right loop in a second centerpiece pendant and tie a knot. Create a second rosary with the five decades, Paters and Aves, using the third centerpiece pendant. String the end of the cord through the top left in the second centerpiece pendant and tie a knot to combine the two rosaries. Take the remaining five inches of cord and string through the bottom of the second pendant. Add two silver beads, one 10 mm clear crystal bead, three silver beads, three 10 mm clear crystal beads, three silver beads, one 10 mm clear crystal bead and two silver beads. String the cord through the top of the crucifix. Cut off any excess cord. Use good quality beads for this special rosary. Mother of pearl beads can be used in place of the clear crystal beads. Use centerpiece pendants with Mary or Jesus pictured on the pendant in sterling silver. Use a sterling silver crucifix for longevity. Rempe, Stephanie. "How to Make a Wedding Rosary." Synonym, https://classroom.synonym.com/how-to-make-a-wedding-rosary-12082190.html. 29 September 2017.